GOES 14, known as GOES-O prior to reaching its operational orbit, is an American weather satellite, which is part of the US National Oceanic and Atmospheric Administration (NOAA)'s Geostationary Operational Environmental Satellite (GOES) system. The spacecraft was built by Boeing and is based on the BSS-601 bus. It is the second of three GOES satellites to use the BSS-601 bus, after GOES 13, which was launched in May 2006. GOES 14 was brought out of storage and began one-minute rapid scans of Tropical Storm Isaac on August 24, 2012. 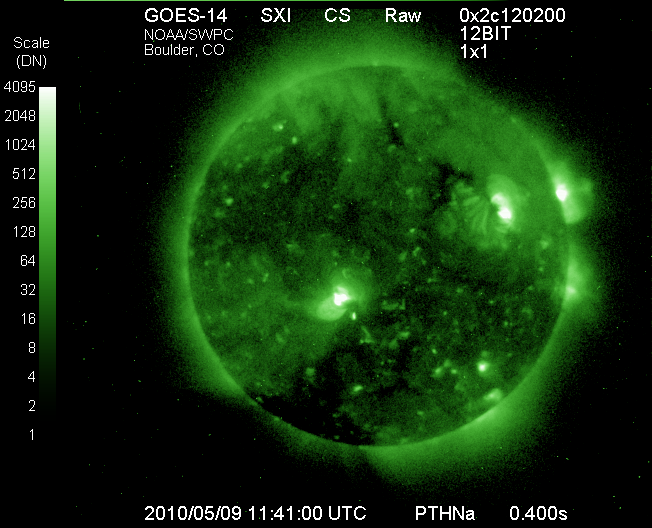 On September 24, 2012, it temporarily assumed the role of GOES-East after GOES 13 experienced technical difficulties. On October 1, 2012 it began moving east at a rate of .9 degrees per day to an ultimate geosynchronous position of 75 degrees west longitude to better cover the Atlantic basin during troubleshooting and repair of GOES 13. GOES 13 was returned to service on 18 October 2012. GOES 14 was used to monitor Hurricane Sandy in parallel with the repaired GOES 13 and was returned to storage afterwards. GOES 14 was reactivated on May 23, 2013 following another anomaly with GOES 13. This is the first full-disk thermal infra-red (IR) image taken by GOES 14. The first attempt to launch GOES-O was made on 26 June 2009, during a launch window running from 22:14-23:14 UTC (18:14-19:14 EDT). Due to rain and lightning at the launch site, the launch was delayed from the start of the window to 22:44 GMT, and once this passed, it was reset to the end of the window. At 22:59 GMT, the launch was scrubbed after field mills detected an unacceptably strong electrical field in the atmosphere, and fifteen minutes would have been required from this clearing in order to launch - longer than remained of the launch window. The weather satellite was eventually launched on 27 June 2009 22:51 UTC (16:51 EDT). ^ a b "Product Outage/Anomaly: GOES-13 (GOES-East) Data Outage". NOAA. Retrieved 23 May 2013. ^ Hillger, Don (27 July 2009). "GOES-14 NOAA/Science Post Launch Test (PLT)". NOAA. Cooperative Institute for Research in the Atmosphere. Retrieved 6 August 2009. ^ "New NOAA Satellite Reaches Orbit". NOAA. 27 June 2009. Retrieved 6 August 2009. ^ "GOES-14 (O) Moving Into on-Orbit Storage Around Earth". Science Daily. Retrieved February 7, 2010. ^ "GOES-14 first full disk image" (JPEG (75k)). NOAA. Retrieved 6 August 2009. Standard file type 389K at http://www.osei.noaa.gov/Events/Current/UNIgoes208_G14.jpg. ^ "GOES-14 Replaces GOES-13 as the GOES East Satellite". NOAA. Retrieved 25 September 2012. ^ "GOES-14 satellite drifts eastward to replace malfunctioning GOES-13 - EarthSky.org". earthsky.org. ^ "Hurricane Sandy Life Cycle from GOES-13 and GOES-14 « CIMSS Satellite Blog". cimss.ssec.wisc.edu. ^ a b GOES-O Launch Coverage (Webcast). Cape Canaveral Air Force Station: NASA TV. 26 June 2009. Retrieved 6 August 2009. ^ a b "Weather Scrub statement for Delta IV GOES-O launch". Spaceref.com. 26 June 2009. Retrieved 6 August 2009. GOES 13, known as GOES-N before becoming operational, is an American weather satellite which forms part of the US National Oceanic and Atmospheric Administration's Geostationary Operational Environmental Satellite system. On April 14, 2010, GOES-13 became the operational weather satellite for GOES-EAST. It was replaced by GOES-16 on December 18, 2017 and on January 8, 2018 its instruments were shut off and it began its three week drift to 60 degrees west longitude, arriving on January 31st. LCC has conducted launches since the unmanned Apollo 4 (Apollo-Saturn 501) launch on November 9, 1967. LCC's first launch with a human crew was Apollo 8 on December 21, 1968. NASA's Space Shuttle program also used LCC. NASA has renovated the center for the upcoming Space Launch System (SLS) missions, which are scheduled to begin in 2020 with Exploration Mission-1. The Mars Scout Program was a NASA initiative to send a series of small, low-cost robotic missions to Mars, competitively selected from innovative proposals by the scientific community. The program had an array of missions destined to reach Mars, and study it at relatively low costs. Each Scout project was to cost less than US$485 million. The Phoenix lander and MAVEN orbiter were selected and developed before the program was retired in 2010. The National Aeronautics and Space Administration (NASA) logo has three main official designs, although the one with stylized red curved text (the "worm") has been retired from official use since 1992. The three logos include the NASA insignia (also known as the "meatball"), the NASA logotype (also known as the "worm"), and the NASA seal.The NASA seal was approved by President Eisenhower in 1959, and slightly modified by President Kennedy in 1961. The Near Earth Network (NEN, formerly GN or Ground Network) provides orbital communications support for near-Earth orbiting customer platforms via various NASA ground stations. Wallops Island, VirginiaAlso under contract are operators at Svalbard Satellite Station, Norway; Poker Flat Research Range and the Alaska Satellite Facility (ASF) in Fairbanks, Alaska; Santiago, Chile; South Point, Hawaii; North Pole, Alaska; and Dongara, Australia. Additionally, the MILA and Wallops stations provide pre-launch, launch, and landing communications support for the Space Shuttle program. The NEN and SN combined were previously referred to as the Spaceflight Tracking and Data Network (STDN). New Millennium Program (NMP) was a NASA project with focus on engineering validation of new technologies for space applications. Funding for the program was eliminated from the FY2009 budget by the 110th United States Congress, effectively leading to its cancellation.The spacecraft in the New Millennium Program were originally named "Deep Space" (for missions demonstrating technology for planetary missions) and "Earth Observing" (for missions demonstrating technology for Earth orbiting missions). With a refocussing of the program in 2000, the Deep Space series was renamed "Space Technology". Sojourner is the Mars Pathfinder robotic Mars rover that landed on July 4, 1997 in the Ares Vallis region, and explored Mars for around three months. It has front and rear cameras and hardware to conduct several scientific experiments. Designed for a mission lasting 7 sols, with possible extension to 30 sols, it was in fact active for 83 sols. The base station had its last communication session with Earth at 3:23 a.m. Pacific Daylight Time on September 27, 1997. The rover needed the base station to communicate with Earth, despite still functioning at the time communications ended.Sojourner traveled a distance of just over 100 meters (330 ft) by the time communication was lost. It was instructed to stay stationary until October 5, 1997 (sol 91) and then drive around the lander. NASA's Solar Terrestrial Probes program (STP) is a series of missions focused on study the Sun-Earth system. It is part of NASA's Heliophysics Science Division within the Science Mission Directorate. The Space Communications and Navigation (SCaN) program places the three prime NASA space communications networks, Space Network (SN), Near Earth Network (NEN) (previously known as the Ground Network or GN), and the Deep Space Network (DSN), under one Management and Systems Engineering umbrella. It was established in 2006. It was previously known as the Space Communications & Data Systems (SCDS) Program. The Day the Earth Smiled refers to July 19, 2013, the date on which the Cassini spacecraft turned to image Saturn, most of its visible ring system, and Earth, during an eclipse of the Sun. The spacecraft had done this twice before (in 2006 and 2012) in its previous nine years in orbit. The name is also used to refer to the activities associated with the event, as well as to the photographic mosaic created from it.Conceived by the planetary scientist Carolyn Porco, who was the imaging team leader for Cassini, the concept called for the people of the world to reflect on their place in the cosmos, to marvel at life on Earth, and, at the time the pictures were taken, to look up and smile in celebration.The final mosaic from July 19, processed at the Cassini Imaging Central Laboratory for Operations (CICLOPS), was released to the public on November 12, 2013. The Day the Earth Smiled photograph includes Earth, Mars, Venus, and many Saturnian moons. A higher-resolution image, which depicts Earth and its moon as distinct points of light, was taken with the Cassini narrow-angle camera and was released shortly afterwards.